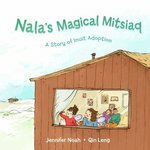 When a blizzard prevents sisters Nala and Qiatsuk from going sledding, they end up staying home and hearing the story of Nala's adoption and learning about Inuit custom adoption instead. Noah, Jennifer, "Nala's Magical Mitsiaq: A Story of Inuit Adoption" (2013). DIVerse Families. 276.